Oh, I fell in love this past weekend. I went to see Brave, in 3D. Well, done Pixar! I loved that the lead characters were both female. I loved that the princess was not pining away for some guy to rescue her. I loved that she was strong willed, independent, and yes, brave. She was a perfect character in that she was smart, yet sometimes fool hardy and also remorseful when she made mistakes. The film really touched me. Not just the storyline, but the fantastic animation also. I had not seen a Pixar 3D film before. This did not disappoint! The hairs on the bear alone made me shed a tear at their beauty. The scenes with Merida and her horse galloping through the forest were incredible. It was just so real feeling. It was a pure visual pleasure to watch! The short before Brave, la Luna, was oh so sweet! Yes, I cried during that too. What a unique concept for a short! A beautifully, touching film. Loved it! 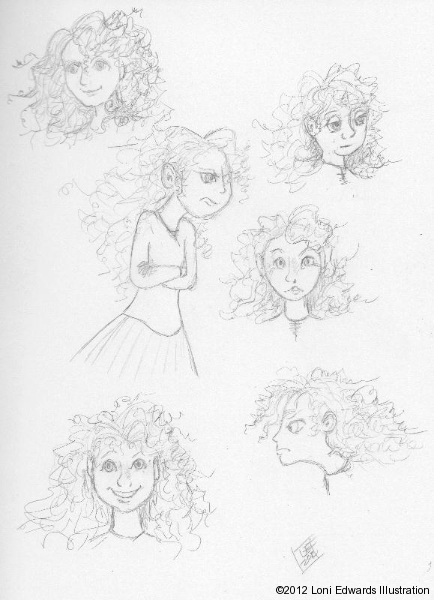 Since watching Brave, Merida has been on my mind a lot. In discussions with friends about the merits of the film, in debates with other friends on the film concept as a whole, and visually. Her hair is just so fantastic to draw. 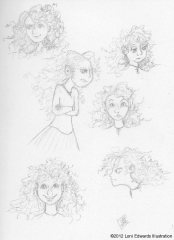 Sketching her expressions was so fun! Here are a few sketches I did today of her. It was a lot of fun. I plan on doing a full fan art piece very soon when I have time, maybe with her horse! ©All Brave and la Luna images are property of Pixar Animation Studios. Brave Fan Art is property of Loni Edwards.